These creepy Halloween decorations will get you in the mood for Halloween. Barbie dolls without a body are kind of creepy, but throw Barbie’s head on a bug and that’s super creepy. An old doll still intact could be worth some money like these 14 fortunes found in attics. This pillow might have people jumping out of their seats. Do you know how often you should be washing your pillows? Rats are scary enough but a rat skeleton raises the creepiness level a little more. Learn the 12 rat myths you need to stop believing. Keep zombies at bay by having one on your door. It’ll let the other zombies know to stay away since there’s a zombie already there. Find out how long you’d last in a zombie apocalypse. Flipping the light switch seems a little more ominous with this light switch. See why smart light switches are a good bet. Imagine having this doll staring you down all the time in your house, pretty creepy. Check out 11 haunted house mysteries no one can explain. Jacine Voorhees is an alternative take on the Friday the 13th character Jason Voorhees and this one is just as scary. Find out about 20 real-life haunted houses you need to see. Slithering snakes can spook any unsuspecting person and a bunch of baby snakes can surely scare someone. Here’s how to keep snakes out of your home. There’s nothing like a little fear to learn a lesson like never run with scissors. Got a dull pair of scissors? Here’s how to sharpen scissors up. Fear the reaper—especially when he’s hanging out on your front porch! This life-sized, five-foot grim reaper, who has busted through his shackles, will stop house guests dead in their tracks when he lets out a sinister screech or a creepy cackle while gesturing with his bony hands. Here’s a DIY zig-zag pumpkin project to try at your Halloween party. Invite trick-or-treaters to enter through the cemetery. These lightweight foam tombstones look so realistic, it’s scary. These Halloween yard decorations come in a pack of four—including “engraved” skeletons and epitaphs—with metal stakes for slaying vampires…um, we mean securing the tombstones into the ground! These duct tape Halloween costumes are genius DIYs. You’ve heard of The Walking Dead, but do you know about the crawling undead? This ravenous stone/resin zombie is emerging from your front lawn in search of brains to feast on, but he’ll settle for the terrified reactions he elicits when he casts his menacing gaze on passersby. These Halloween projects are monstrously creative. A caterpillar in its cocoon is preparing to become a butterfly, but this cobweb-wrapped dead body is just preparing to scare the bejeezus out of your neighbors. The 7-foot corpse comes with hooks for hanging from an awning, a tree branch, or any other spot that can support less than a pound. A whopping 100 ways to get into the spirit of fall. Scatter three of these furry rodents on the porch after dark, then invite a few friends over and prepare for some serious shrieking. As if the straggly hair were not enough, each 5-inch rat looks up at you with a pair of beady eyes and two little fangs. To buy: $15 for 3, amazon.com. Here’s how to prevent those real pests from infiltrating your house this fall. Arachnophobia is an understatement when it comes to a 6-1/2-foot spider on your front lawn. This hairy beast can’t be stopped—it comes with secure attachments, so it can even survive strong wind and rain. It’s very adjustable, too; twist it into a different position each day to really freak people out. Here are 20 brilliant jack-o-lantern ideas that will make you wish you had a bigger porch. You won’t find these window treatments at Bed Bath and Beyond (maybe Blood Bath and Beyond…we couldn’t resist)! This 2-piece plastic mural broadcasts ominous warnings to onlookers through an obscured window with bloody silhouettes pressed up against the glass. Some haunted houses are real—these are 20 of them. Double, double toil and trouble! This battery-operated witch will cast a creepy spell on the neighborhood. Her eyes glow when she moves and speaks, and you can give her a tray of candy (or a fake bloody brain) to hold! You need to see these 14 fall wreaths. Enlist the trees on your property to scare the wits out of everyone who walks by. A plastic face—camouflaged to look like bark—adheres to the tree trunk and uses 2 AA batteries to make the red LED eyes light up. Curb appeal never looked this eerie. These 20 home improvement projects are perfect for fall. This evil little creature with light-up eyes isn’t your mother’s garden gnome. Like a pint-sized extra from Night of the Living Dead, he’s a flesh-eating version of the classic lawn ornament—so watch your ankles! Dealing with fall leaves on your property? Here’s what other smart homeowners do. Creepy clowns are having a moment. 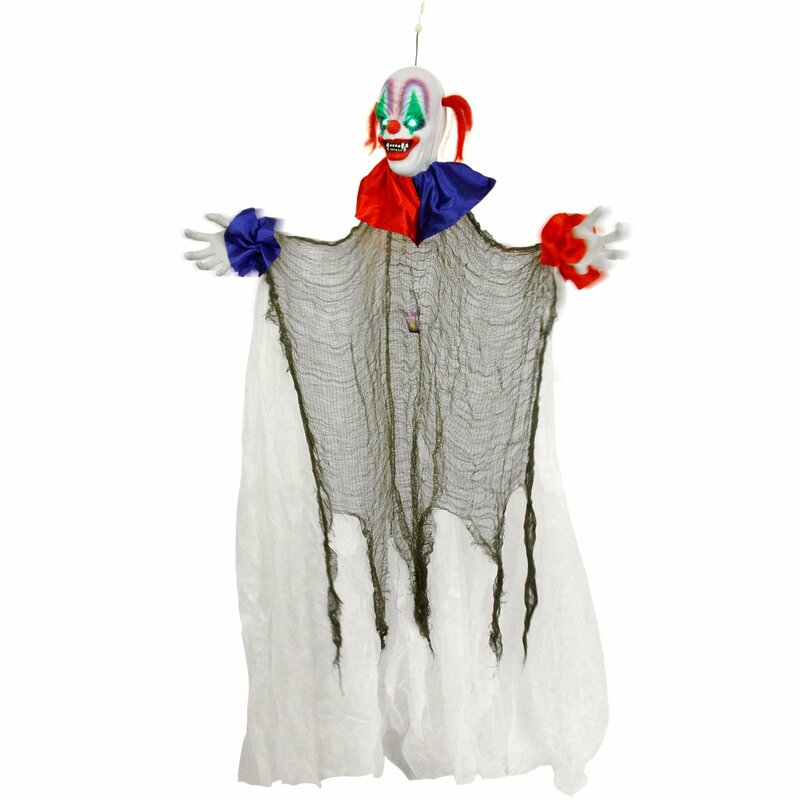 And if Pennywise the Dancing Clown from Stephen King’s It is your idea of a living nightmare, then this sinister character is the Halloween yard decoration for you. Not only do his evil eyes double as strobe lights, but his entire head spins around in 360 degrees, Exorcist-style. It’s time to prep your garden for fall! Here are 12 things to do now. Remember those ghoulish twins who were slaughtered at the Overlook Hotel in The Shining? If you smooshed them together into one creepy doll, it would be this life-size two-headed creature. The foam-filled rubber doll, standing 4 feet tall, makes quite the welcoming committee when positioned outside your front door. Check out these 24 more clever ways to decorate your home for Halloween.